Last week while shopping at a local thrift store I found a large camera case full of various items. Of course the main piece that attracted me was the camera, but what were the other odd items? The inside of the case was grimy with black pieces of foam that had crumbled apart from age. I carefully inspected the camera and purchased it with the case and contents. Later that night, I removed the camera from the case and put it to the side. I knew cleaning out the case was going to be messy, so I put on a pair of latex gloves and started to slowly inspect each item. A 100mm Minolta Rokkor macro lens attached to a bellows on a rail that measures about 8 inches in length. There was also a Minolta pistol trigger grip with a shutter release cable. Odd shaped mirrors, wires and square plates that somehow attached to the bellows. What was all this equipment used for? Then I found a receipt. The camera was sold to Dr. Graydon Briggs in Salt Lake City. He purchased the camera on April 23, 1976 from Washington Scientific Camera Company. The description of the camera and contents are listed as: Complete Minolta SR-T202 Clinical Camera Unit, Clinical Camera Case, Dental Mirrors, Columbia wire retractor, Minolta F4 100mm lens, and Minolta 18LS Flash. With a simple Google search, I found the original owner, Dr. Graydon Briggs, DDS, a successful Utah dentist that was known for thousands of root canals. He passed away on November 11, 2013 at the age of 66. The Minolta camera kit he purchased for $587 in 1976 was used in his dental practice. From the receipt, you can see that he made two payments for the complete unit. To put this price tag in perspective, in 1976 a loaf of bread was $.30, a gallon of milk was $1.42, gasoline was $.59 per gallon, a new car was $4,100, and the average price of a home was $43,000. In 1976, this clinical camera unit would have cost the 2015 equivalent of $6,600. You made our day – yeh these turkeys can’t afford a phone but look at the bargains you get. We do not maintain a phone at the shop & warehouse as we are in & out so much – We do not operate a retail store – can give better bargains that way. If you find it necessary you may reach us at our home morning & evenings as a rule at (206) 863-7172 or call Mr. Cliff Freede (?) at the U of W Dental School who can relay messages or give all the answers on problems – his phone # 206-543-5953. We are no longer going to carry the #704 case – so I have sent you the #705 which is larger at the old price of $27.50 – it is now $34.00. We do have our new custom camera case at $38.00 but was hesitant in sending it. Enclosed is our new price sheets. Thank you for your order. The camera is mounted to the bellows at one end and the 100mm Rokkor lens at the other. A dentist would use their right-hand to focus by extending or retracting the bellows, and squeeze the shutter trigger with the left-hand. Based on the odd shape of the mirrors, they would be placed in the patient’s mouth so the camera could capture photos of those hard-to-reach areas. I haven’t included an image of the mirrors because they need to be sterilized or thrown away. The Minolta SR-T202 was the top-of-the-line camera in the series. When it’s not attached to the bellows and used for macro photos of someone’s throbbing tooth, it has a sharp 50mm Rokkor f/1.7 lens. I plan to write a full camera review after testing it with some film next week. For this post I wanted to feature the unique use, history, and the original owner of this camera. MailPix – Save 50% on all photo books, 60% off all canvas prints, receive 100 free 4×6 prints for creating an account. For the past month I’ve been running test film through various cameras so I can share the results here. This week, I want to show off some of the most recent additions to my collection. I found this Argus C3 at a local thrift store for $10. It’s one of the cleanest thrift store finds I’ve purchased. The camera and case were in excellent condition. Someone really cared for this camera. And I was surprised to find one because I had only ever seen one once before, the previous day. A friend showed me his father’s Argus C3 that he used in the Philippines during World War II. The leather case was heavily worn and one of the three aperture leafs was missing. Not a functional camera, but a sentimental item; a wonderful reminder of his dad and his service in the military. Part of the enjoyment from collecting and using vintage cameras is learning about the people and companies that made them. The history of Argus takes place during the Great Depression in Ann Arbor, Michigan, USA. In 1929, local inventor Charles A. Verschoor and the Mayor of Ann Arbor, William E. Brown Jr., created a radio manufacturing business that was funded by local bankers. The company was named the International Radio Company and produced the Kadette, the first radio that used a series of tubes instead of a large transformer. The name of the company was changed in 1935 to the International Research Corporation. In 1936, Verschoor traveled to Europe and returned with an idea of producing a rangefinder camera, like the Leica. In 1940 the company released its first camera and renamed itself International Industries. By 1941 the company concentrated on cameras and was renamed Argus Cameras Inc. The name Argus comes from the mythical Greek god of 1,000 eyes. During the 1940’s, Argus expanded its products from cameras to other optical equipment and held several contracts with the U.S. Government during World War II and the Korean War. Argus was responsible for a prosperous community in Ann Arbor, employing 1,300 people and occupying 2 city blocks during the peak of operation. In 1959, Argus was acquired by Sylvania, an American tube and semiconductor manufacturer. Argus was sold again by 1969 and the name was used throughout the 1970’s on camera products that were re-badged. Today the original Argus manufacturing facility and offices are used for various departments by the University of Michigan. The Argus C3 is a 35mm rangefinder camera that was mass-produced from 1939 to 1966. It earned a nickname as “The Brick” because of its shape and size. The C3 has a reputation for being a rugged camera. There’s even a US Army Service Manual that details how to field strip and repair an Argus. More than 2 million C3 cameras were sold during its 27-year production. The body is made from Bakelite, features a 50mm f/3.5 – 16 Cintar anastigmatic triplet lens, and has a rangefinder focus. The C3 out-sold most American competitors, including Kodak’s 35 Rangefinder, and several inexpensive Japanese SLR’s in the 1960’s. The C3 is also known as “The Harry Potter Camera.” In the movie series based on J.K. Rowling’s books, the character Colin Creevey is a muggle-born wizard that uses an Argus C3 Matchmatic at Hogwarts School of Witchcraft & Wizardry. During manufacturing, Argus gave each camera a serial number. After doing some research online, I found that the serial number on mine indicates it was made in 1956. That makes my camera 59 years old! The C3 has a cold shoe, but has a two-pin connector on the side for a dedicated flash unit. I believe the cameras were originally sold with a flash gun. The flash took C-batteries and used common 25b flash bulbs. The shutter speed is controlled by rotating the dial on the front right-hand side of the camera. Rotating the dial counter-clockwise allows shutter speeds of 1/10th to 1/300th of a second. Bulb mode can be enable for long exposures by twisting the dial that surrounds the shutter release to ‘B’. Hi Shaun – to clean out the old C3, you’ll need to take the lens off. Not a big deal – they made multiple lenses and it was designed to swap them out. Set the camera to infinity and unscrew the dome-headed screw on the gear between the lens and focus gear. Then lift out the gear and you should be able to unscrew the lens from the body. You can now scrub any moving parts with naphtha (you can buy it at any good hardware store or as Zippo-style lighter fluid). It won’t hurt anything in a C3 so you can use a good amount. After that you can flush it all out with 99% alcohol (available at pharmacies or for a lifetime supply in gallon jugs at nail salon supply stores). The alcohol will flush out any naphtha residue and won’t leave a trace. The camera should work fine after this but you can rub a tiny amount of machine oil on the threads to loosen them up even more. Because my C3 is in such good condition and the back of the camera seals very tight, I decided to bypass a cheap test roll of 35mm film. My first roll through the C3 was some Kodak Tri-X 400. On the top of the C3 is a manual frame counter. To advance the film, the film catch switch is clicked to the left and the winding knob is turned clockwise. This turns the frame counter one complete rotation as the gear block assembly moves the film from the canister to the take-up spool inside the camera body. At some point during my initial test, I forgot to advance the film. What resulted was a triple exposure of an old truck, the ceiling of my local Apple store, and an iBooks display from the same store. Using the cocking lever on the front of the camera was another failure on my part. No less than a dozen times did I hold the camera up, frame my shot, focus, and then press down on the shutter release only to find that I hadn’t cocked the camera. Based on my last two examples, I’m telling myself again how digital photography has really spoiled us. Co-Worker, Grace in Salt Lake City, Utah, USA. The Argus C3 has quickly become one of my favorite cameras. I’ve kept it in my backpack every day since I purchased it last July. When I sent off that first roll of film to the lab, I didn’t know what to expect. I admit that I was surprised by the results. I guess I was expecting less than average images from an old mechanical camera. I’ve read other reviews online about the C3 and compared notes. There are many who prefer other rangefinder cameras for various reasons, but you can’t argue with 2 million C3’s sold over a 27-years. This was the camera of choice for many Americans into the 1960’s. I think there’s a certain pride that Argus collectors have and it goes beyond the ability to create a good photo. The company was formed in one of the worst economic times in American history. Then went on to employee 1,300 people and sustain an entire community. And like many private companies, helped the United States in a time of war. Argus created something that made people proud to be American. Who Are You? Why Film? Why Now? This is one of those moments where you attempt to accomplish something, but you have so much that you want to do, you don’t know where to start. Let me begin with who I am and what direction I want for Utah Film Photography. 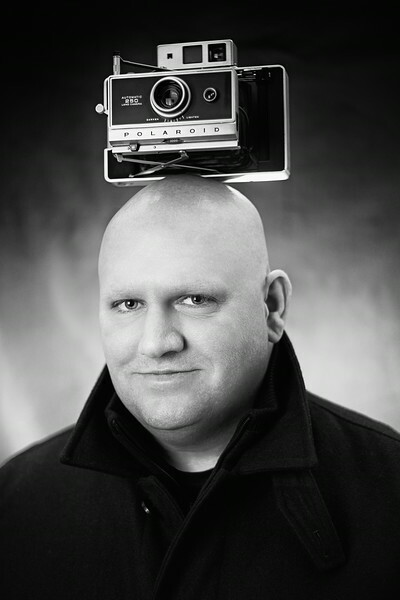 I’m Shaun Nelson, a photographer from South Ogden, Utah, USA. I originally took up photography 14 years ago when my oldest son was born. I consider myself part of the new generation of photographers in the way that I started shooting digital. It’s all I’ve known until the last year. Prior to digital, I had no experience or desire to shoot film. In October 2013, Jacob Nuttall from Acme Camera Company was demonstrating an old Polaroid Land Camera 250 at a Studio o2o Creative Exchange. I was honestly shocked at the beauty and contrast of the black and white images coming out of the vintage camera. Two weeks later, I bought my first Land Camera. In December, my wife gave me an old Canon A1 for Christmas. From that point forward, I’ve been buying vintage cameras and shooting film for fun. Since January 2014, I’ve collected over 25 film cameras. At times it’s made my wife very nervous that I’ve immersed myself into something so quickly. My feeling about my camera collection is simple: I won’t buy a camera that I can’t put film in and use. Museum pieces are nice, just like classic cars and comic books, but I want to take them out and enjoy them. Along with collecting the cameras, I’ve found a lot of satisfaction researching them and learning about them. There are so many fantastic stories behind companies, specific camera models, and the people who made them. In many ways, it’s a new culture of creativity that’s been opened to me. And I want everyone that loves photography, film or digital, to feel the same. That’s why I’ve created this site. Self-portrait inspired by Kenneth Linge and Uncle Fester. This site isn’t about film versus digital. It’s not about who won the photography war, megapixels or silver halide. It’s about preserving what is becoming a fading art. It’s about sharing, inspiring, and having fun. The desires I have for this site can be found on the About page. This site will feature articles written by myself and special guests. If you visit Utah Film Photography and see something that you’ve known for years, or though experience, and recognize information needs to be added or corrected, I ask that you be patient with those who are just starting their own understanding of film photography. I invite you to share your own thoughts here, on Facebook and Twitter. This site will not be a negative experience for the content creators, casual readers, and participants. Why start another site about film photography? Let me attempt to explain with a lame analogy. Remember the first time you heard your favorite band or singer? Do you remember wanting to share a specific song with your friends or family? It’s an exciting moment. As time passes we don’t typically wake up one day and stop liking that band or specific style of music. We might enjoy other types of music, add new genres to our collection, but that favorite band continues to stay with us, year-after-year, decade-after-decade. Even when that band has broken up, some members have passed away or entered rehab for the 10th time, we love that one particular song or album. If you know me on a personal level, you might think I’ve engaged in an expensive, eccentric, or trendy hobby. That’s not true. With this site, I want to share my own experience and discoveries with film photography. Talking about film photography and vintage cameras is exciting to me. Just like the excitement I had when I came upon my favorite band and music, I wanted to share it. That’s how I feel about photography.